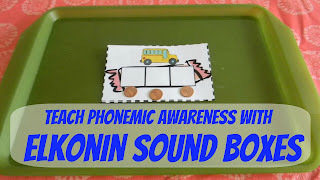 Using elkonin boxes is a simple and quick way to teach phonemic awareness. Good readers are able to segement words and hear individual phonemes in words. Phonemes are the smallest unit of sound in a word. In the word cat, the first phoneme is the /c/ sound. 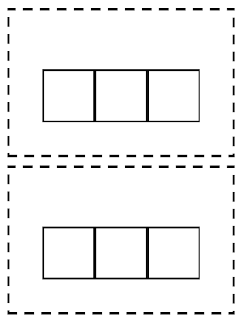 Elkonin boxes are one strategy for helping readers to segment individual sounds in words. Elkonin boxes are simple boxes that can be drawn on paper. One box is drawn for each phoneme in a word. For a CVC word like cat, there would be three boxes. 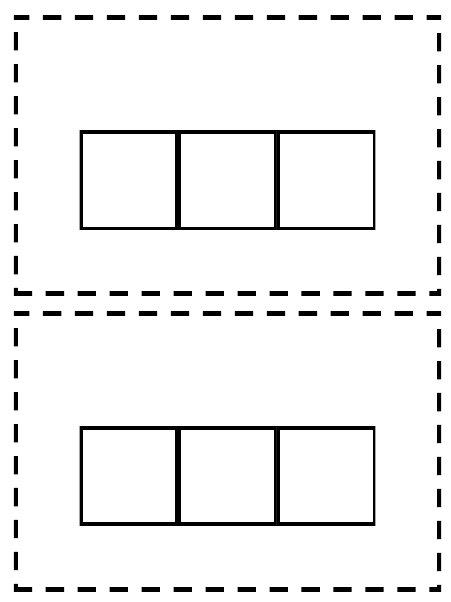 However, since a box is drawn for each phoneme (not each letter), some words with more than three letters would still have three boxes. One example of this is the word house. House has three sounds h/ou/s. Likewise, some words like b/oy may have three letters but only two sounds. Two boxes would be drawn for a word like that. As a child becomes a more proficient reader and writer, the teacher will transition to letter boxes that match traditional spelling patterns. 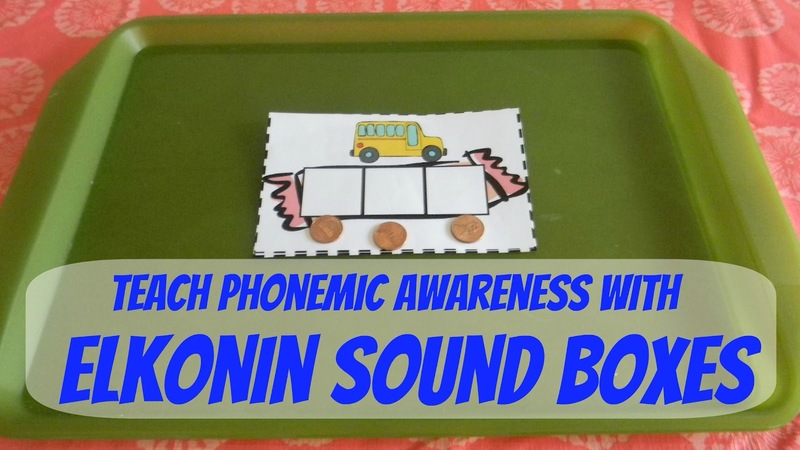 Remember, the goal of elkonin boxes or sound boxes is help children hear the individual phonemes in a word. read some repetitive books from memory. Give the child an elkonin box and name the picture. Have the child say the word slowly. Have the child push a penny or a counter into each box as they say each phoneme in the word. Introduce Elkonin boxes: The first step is to introduce Elkonin boxes to your child. You will probably have to help your child coordinate the gross motor movement timed with the sound. This calls for demonstration. Use hand over hand practice and generally give the child control. Teacher:"Let's write the word cat. What letter to do you think you see at the beginning of the word cat?" Student makes no response. Teacher:"Say the word slowly. C-a-t."
When the teacher verbalizes the phoneme, the teacher has just done the work for the child. Elkonin boxes are a good way to get the child used to controlling saying words slowly. Transition to Word boxes: Once the child controls using Elkonin boxes in isolation, they can transition to word boxes. Word boxes can be used in spelling to help children isolate the phonemes but also to spell using conventional spelling. Here is a freebie of a blank elkonin box. Add a simple drawing or clip a picture and glue to the top of each card. These are designed for words with three phonemes. They may or may not be words with three letters. For example, cat, dog, and bat would work with these cards. House, boat, sheep would also work because they can be broken into three sounds: h/ou/s. 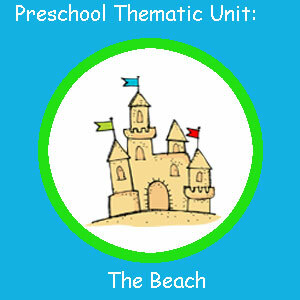 If you would like elkonin sound boxes that are premade with pictures, consider my beach thematic unit. It includes a sight word stretch activity. You can teach the child to stretch out the sounds in the words just like they stretch out a beach towel on the sand. You can purchase the unit that includes the sight word stretch in my teachers pay teachers store. There are freebies to check out there too! Thanks for sharing! Being that I am in first grade I have used these boxes, but it is nice to have a great reminder of having the students saying it slowly, not the teacher! Great post! This is really interesting! I never heard of Elkonin boxes, but they make a lot of sense.